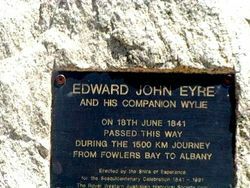 A monument commemorates the explorer Edward John Eyre and his companion Wylie who passed through the area on their way from Fowlers Bay to Albany. 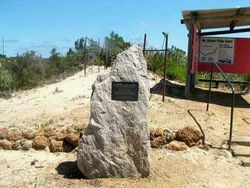 Land exploration of the Esperance region can properly said to have begun in 1841. 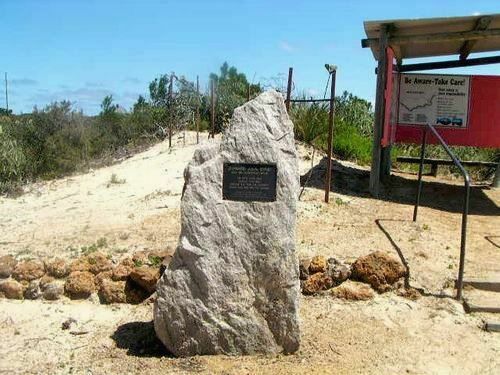 At the time Edward John Eyre and his aboriginal companion Wylie were involved in a 'do or die' struggle to cross the Nullarbor, desperately hoping to reach the safety of the King George`s Sound settlement. Suffering from starvation and exposure, Eyre and Wylie nearly came to grief at Lucky Bay. The pair were miraculously rescued by Captain Rossiter, the English master of a French whaling ship named the "Mississippi." Passed This Way During The 1500 km Journey From Fowlers Bay To Albany.